intentional teaching practices to foster their development. 1. Recognise and respond to all children’s individual strengths, abilities, interests and voices. 2. Build strong secure relationships with the children so they feel supported during their time with us. children with additional needs to negotiate their everyday lives. 2. Provide information, contacts and support for the children, parents, and families regarding children’s health and development. 1. Be an exclusive service providing the best quality care and education for children in the local area. 2. Have strong community networks and links where we support and are supported by the surrounding businesses and community members. 1. Provide qualified educators that are experienced in child development and who regularly update their skills and knowledge through recognised professional development. 2. Provide time for educators to critically reflect and improve on their pedagogical practices. 1. Provide a flexible program based on the Early Years Learning Framework where all children experience learning that is engaging and builds success for future education and life. 2. Provide a specific 4-5 years exclusive School Readiness program and Wellbeing program to ensure all children are prepared for the transition to formal schooling. 3. Provide age appropriate and meaningful resources to foster engagement in learning. Provide a safe, secure, happy and loving home like natural environment where children and families have a sense of belonging and can be themselves. Provide a place where children learn to appreciate and value the natural surrounding environment and take care and responsibility for it for future generations. 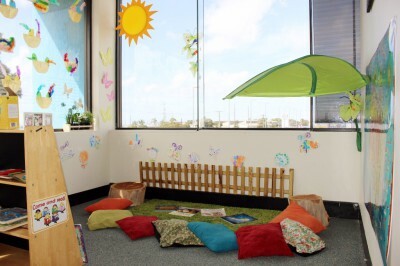 Provide an environment that has flexible spaces that are responsive to interests and abilities of each child. At Kindarama we acknowledge the importance of play in early childhood development. Play is very important as it is the most effective learning tool, and is central to a child’s development. Play is non-threatening, spontaneous, and meaningful. Through play babies and young children explore and learn to understand the world around them as they come to communicate, discover, imagine and create. When children play they are showing what they have learned and what they are trying to understand. When children play with other children they create social groups, test out ideas, challenge each other’s thinking and build new understandings. This is why play is one of the foundations of the Early Years Learning Framework. By using this Framework Educators will guide children’s play by carefully designing learning activities and stimulating Indoor and Outdoor learning environments. We also acknowledge that each child is unique and therefore will progress at their own pace. The EYLF is a key component of the National Quality Framework which has been developed by Council of Australian Governments (COAG) to assist Educators to provide for young children throughout Australia in their early years with opportunities to maximise their potential and develop a foundation for success in the future. Belonging is the basis for living a fulfilling life. When children feel as though they belong in the group, their learning and development thrives. Being is about living here and now. Childhood is a special time in life, and children need time to just ‘be’- time to play, try new things and have fun. At Kindarama we have identified 4 key values that are the basis of our Philosophy, Service Aims and Goals and educational practice. These 4 key values are: Relationships, Children’s Voices, Intentional Teaching and Wellbeing. Relationships: We believe relationships are key to children’s development as they learn to navigate the world around them. At Kindarama this includes relationships developed with the children, families, between educators and with the wider community that our service is a part of. Through strong relationships we can work collaboratively to ensure all children receive the highest quality care and education. Children’s Voices: We recognise that children are unique individuals who have their own ideas, interests, skills and needs and by promoting and listening to their voices we can plan and provide for each individual child. Intentional Teaching: We believe that intentional teaching strategies can be used to guide children’s learning and development to ensure all developmental domains are supported through planned and spontaneous experiences. Wellbeing: Our approach to children’s wellbeing is that we promote a healthy lifestyle for all children and families, which includes meeting our bodies needs for nutrition, physical activity, rest and hygiene as well as emotional and spiritual wellbeing. These 4 key values are embedded across our service through daily routines, pedagogical practices, service leadership and management as well as across the classroom settings. All educators strive to uphold these values as they educate and care for the children at our service.